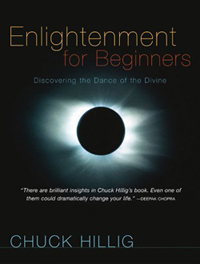 Enlightenment for Beginners is the simple story about how (and why) you've been cleverly imagining yourself to be only a separate and limited Being. After identifying the Reader as "Black Dot #1," the Author then shows how Life is only a wonderful Game of pretending to not be "Black Dot #2,"..... better known as "The Other." Using easily-understood words and drawings, the Author invites the Reader to discover that they already are "Who" it is that they've been looking for. After a 1600 word Introduction (which, the Author suggests, the younger Readers can easily skip), the Main Text uses only another 2000 very common and ordinary words to unfold its entire story. Although most people can read this amazing little book in under 30 minutes, its profound spiritual impact can last a lifetime. This book is also available as a DVD or as a CD-ROM.